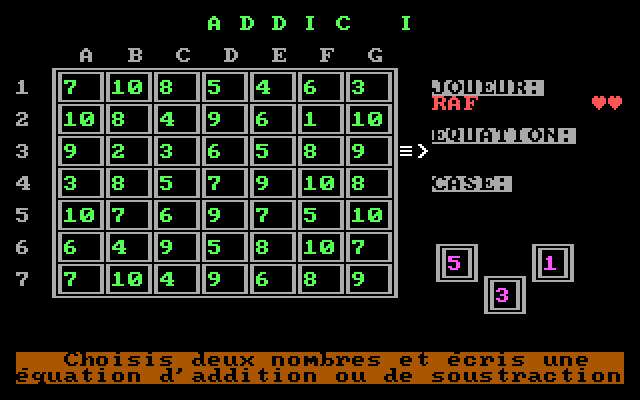 Computa games is an educational math game created by André Normandeau. 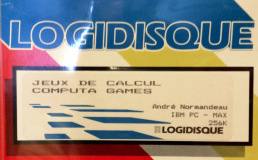 Winner of the 1987 APOLOG contest organized by the Ministère de l'éducation du Québec in collaboration with AQUOPS, this game was distributed to all Quebec schools. 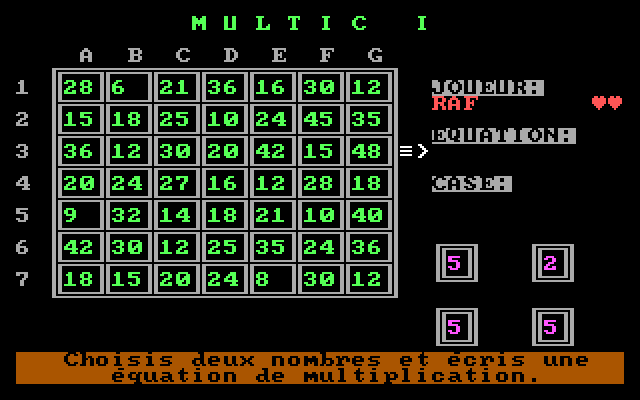 Computa games is the english version of Jeux de calcul. The ESCAPE key can now be used to go back in menus, or to end a game. The game language can be changed. 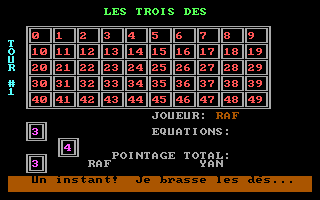 (Option in the main menu). No teacher's menu nor options for saving results. Fewer confirmations when entering names. Allow using names longer than 3 characters in ADDIC and MULTIC games. Menus a bit more colorful and uniformized. The game is not offered for download yet. 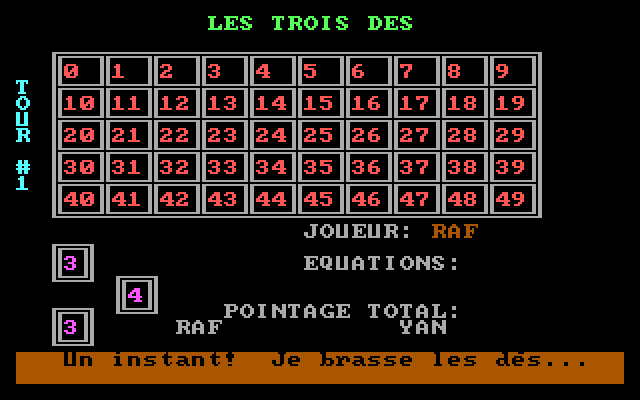 The first player to form a line of 4 tokens wins. 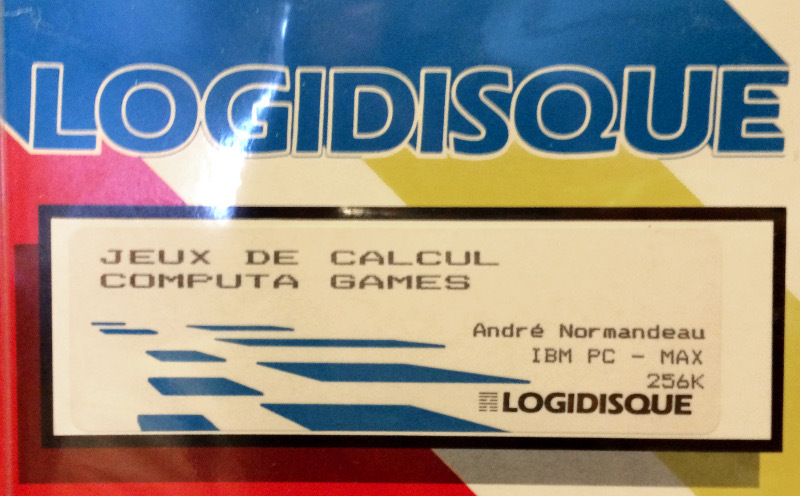 In the early 80s, André Normandeau was a mathematics counsellor and felt that we did not play enough with numbers. Inspired by ideas from American magazines, he built a few table games to be put to the test by colleagues. 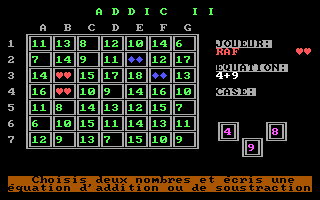 The players had to roll their dice, use the obtained numbers in an equation and then place their token in a numbered grid, on a cell matching the result, ultimately to win by being first to form a line. 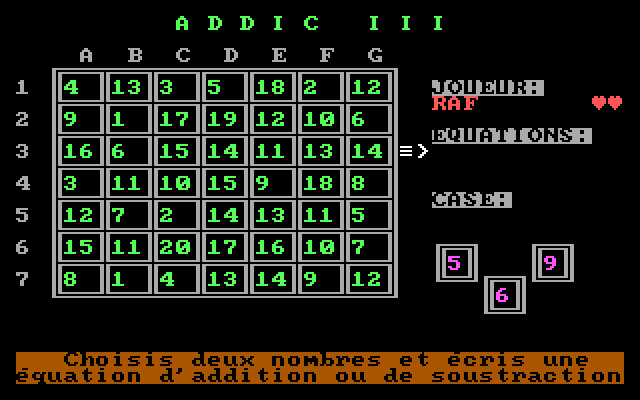 Realizing how suitable a computer would be to close this gap, he initiates himself to BASIC programming on Commodore 64 and creates a game that improves for a few years by being tested by his children (who were good at doing unforeseen manipulations, revealing bugs) and also a teacher who had a Commodore 64 in his classroom. 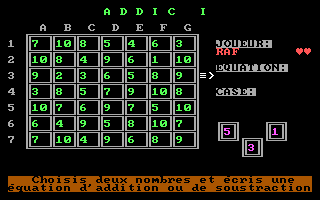 The game is eventually converted to GW-Basic, enabling its use on PC and compatibles. One day a coworker shows him a letter announcing a software contest (APOLOG) organized by the Ministère de l'Éducation du Québec in collaboration with AQUOPS (Association Québécoise des Utilisateurs de l’Ordinateur au Primaire et au Secondaire). He thinks to himself "Why not?" and enters into the contest with his game. A few months later, having almost forgotten about the contest, he receives a phone call. He is asked if he will be at the congress where contest results will be revealed and that otherwise his presence in the room at least during the announcement is wished for because he is a finalist! 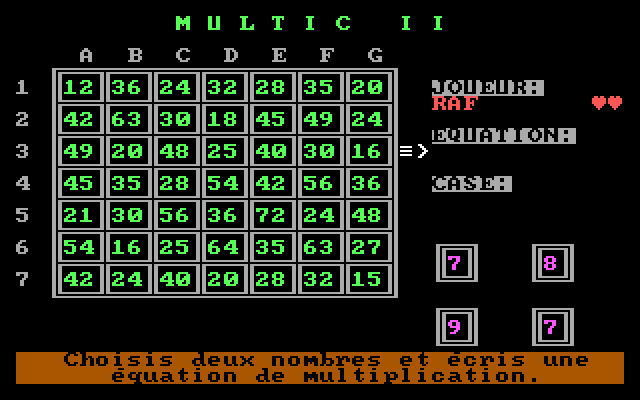 His game is awarded first place for the primary school level of the contest, a grant for its publication and distribution to all Quebec schools. 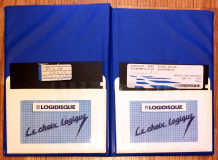 The publisher selected for Computa games was Logidisque inc., known also for the game Mimi la fourmi and later for the Hugo plus spell checker. 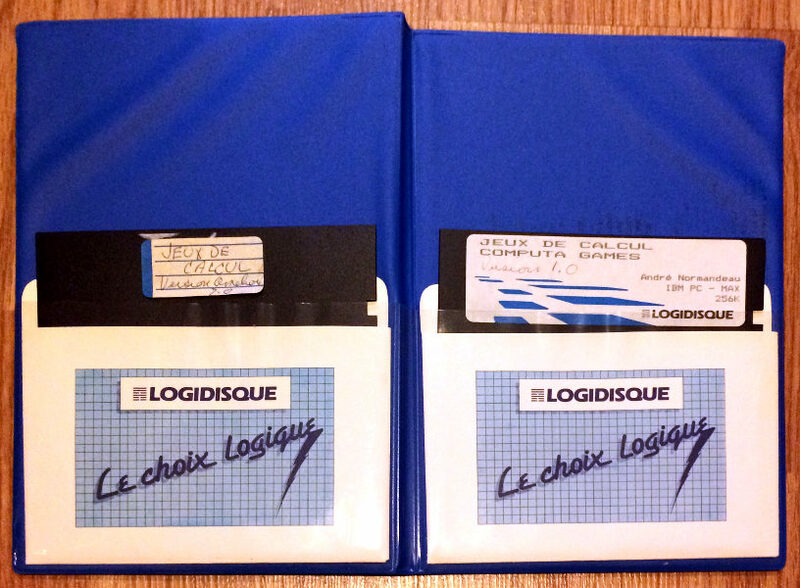 Here are a few pictures of the game in its original packaging. 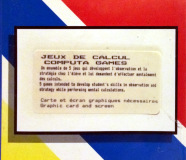 The price set by the publisher for the game (around 1990) was 49,95$ CAD. This would be about 82,58$ in 2016 dollars. For a parent considering the acquisition of the game for his children, it would seem like the price was a major barrier, given that the game author confesses never hearing about any sales. 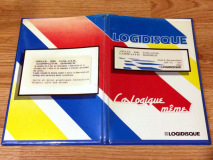 A quick search at the registraire des entreprises du Québec indicates that Logidisque inc. is no longer in activity since 2001. The equivalent in today's dollars was estimated using the Bank of Canada Feuille de calcul de l'inflation. 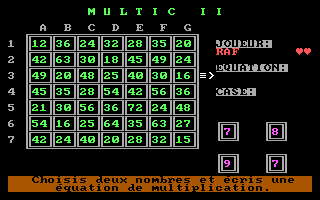 I remember playing this game in 1990 or 1991 when we used the school computers for the first time, in 3rd grade. Though I had lost, the game clearly made an impression on me. 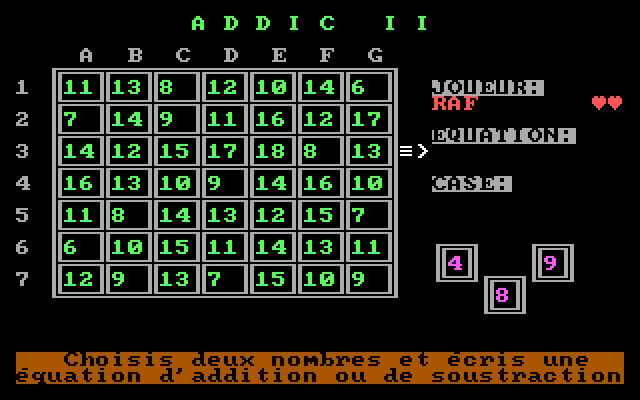 Even though I do not recall playing it that many times at school, I somehow never forgot the name of the author. Thanks to this I was able meet him in early 2016 and finally play this game again. 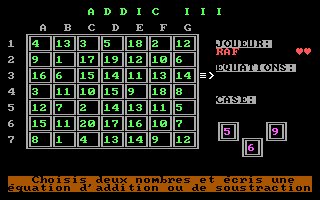 While of modest appearance by today's standards, Computa games remains an excellent game to play with one's children. I thought it was regrettable that no traces of it could be found on the net, an unfortunately common situation that many made-and-distributed-mostly(if not only)-in-Quebec software share. 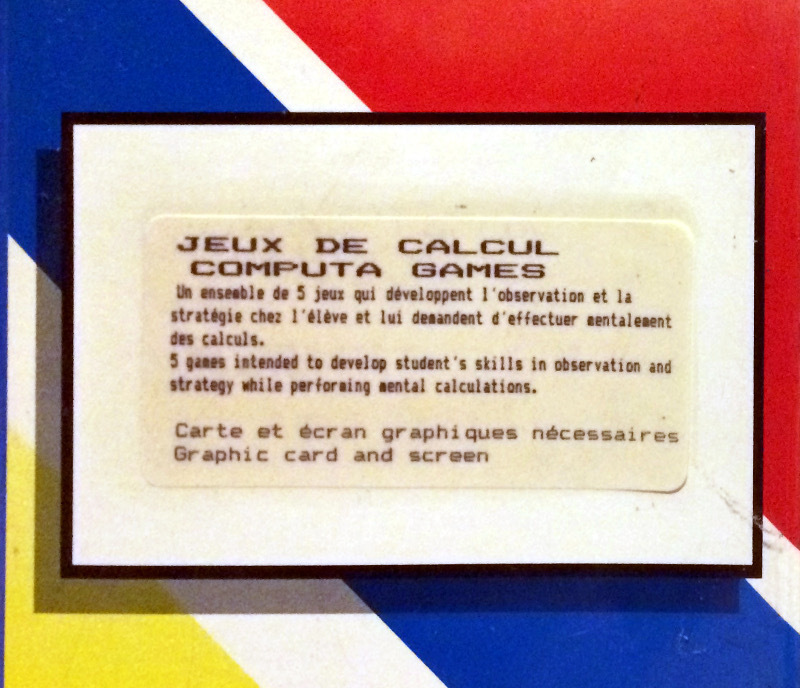 I believe this game, part of an historic effort to put computers at the service of education, deserves its own page in Quebec's history of computing. It definitely should be preserved. 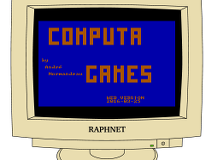 With the agreement of the original author and thinking of all who remembering the game probably searched for it, I created this page hoping that from now on, finding as well as playing Computa games will be possible, and easy. As far as I can tell, this game is Abandonware. 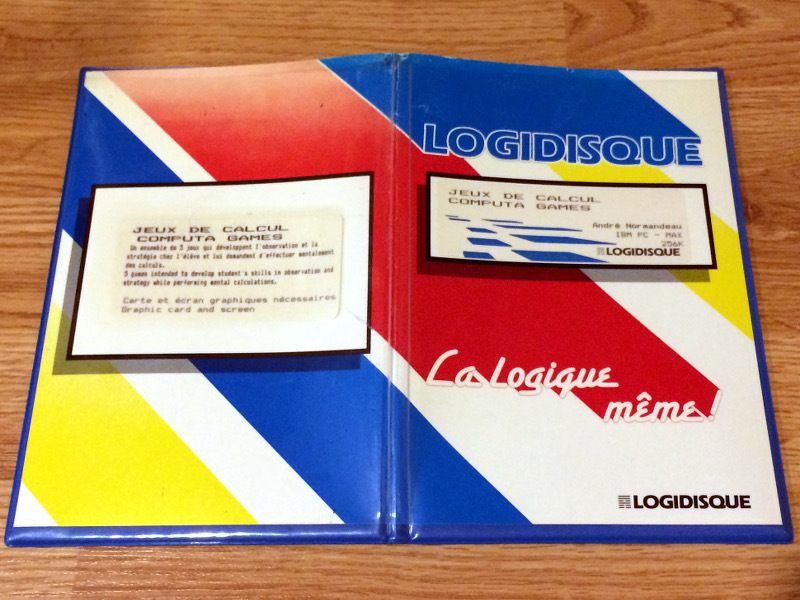 It has not been distributed in a long time and its publisher (Logidisque) does not exists anymore. Combined to the fact that this game is for an obsolete platform, it seem reasonable to assume that if the rights were transfered to another entity which still exists, future commercial exploitation of the game by said entity is very unlikely. I therefore make this game available without any bad intentions and not for profit. All I hope is that an artefact important to me, one that usefully entertained thousands of students from my generation, gets preserved and maybe rediscovered by the next.